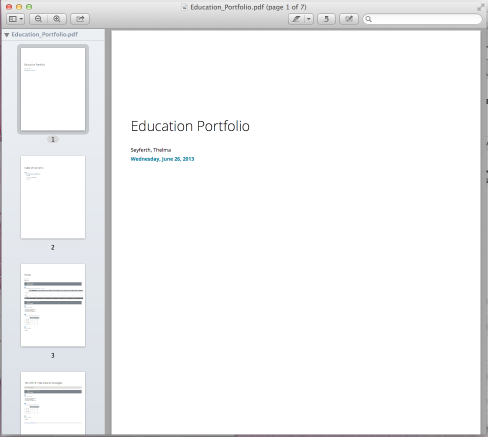 The 'Download as PDF' feature enables you to download, access, and share your Portfolio as a PDF document. 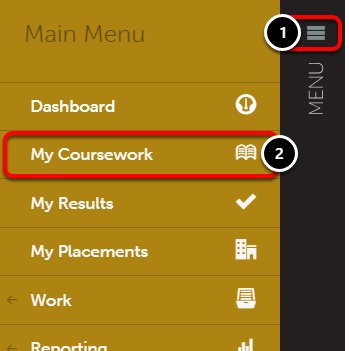 It compiles all of your content in an intuitive layout, complete with a cover page and table of contents. NOTE: This feature is different from the 'Download' feature, which downloads a package to your computer to view your Portfolio(s) in an interactive format without internet access. Locate the portfolio that you would like to download to zip file. 3. Click anywhere on the portfolio's row to reveal its options. Select Download as PDF. 4. Click on the Download as PDF button from the main table of contents page. Regardless of where you selected to Download as PDF, a pop-up message will appear on your screen to notify you that the downloading process has begun. NOTE: If the portfolio is large, containing lots of content, this process can take some time. Until you see the downloaded file appear on your computer, do not close this window. The downloaded file will appear on your computer. Double-click the file's icon to open it. NOTE: Download locations will vary. If you are uncertain of where the file has been downloaded, please check your browser's settings. 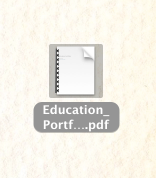 The PDF file will open on the cover page of your ePortfolio. Scroll down through the document to reveal the subsequent pages.